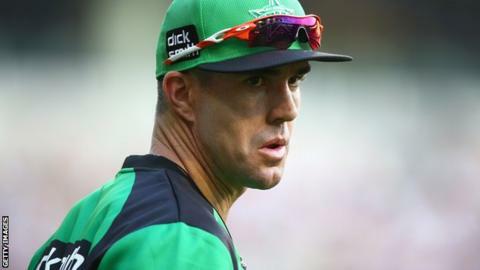 Former England captain Kevin Pietersen has joined the BBC Test Match Special commentary team for the World Cup in Australia and New Zealand. The four-time Ashes winner will be on air for the quarter-finals onwards. "I really enjoyed having a go at some commentary during the Big Bash," said Pietersen. "It will be good to return to Australia for the climax of what should be an exciting tournament." TMS will commentate on all games via Radio 5 live and 5 live sports extra. The BBC's head of radio sport Richard Burgess added: "This is an ambitious year for cricket on BBC radio - with 5 live leading the way with its biggest ever offer. "I'd also like to welcome Kevin Pietersen to the fold for the Cricket World Cup and look forward to hearing him on TMS." Pietersen's fellow pundits will include Geoffrey Boycott, Michael Vaughan, Graeme Swann, Vic Marks and England Women's World Cup winner Ebony Rainford-Brent. They will be alongside Jonathan Agnew, Alison Mitchell, Simon Mann, Charles Dagnall and Kevin Howells, along with international legends of the game in Kapil Dev, Allan Border, Jeremy Coney and Sunil Gavaskar. Listeners will be able to access live commentary via the BBC Sport website as well as text updates, scorecards, the best of social media and analysis from the TMS Team. There will be reports from every game plus reaction from the key clashes. The BBC Sport app will have live alerts - new for the World Cup - where users can sign up to receive information on every team and be notified of every wicket as they happen, straight to a mobile phone. And 'The Analyst', former cricketer Simon Hughes, joins the BBC Sport online team for the World Cup. Simon will cast his expert eye over the biggest issues of the tournament via regular video blogs.